After reading DK’s post (@ Culinary Bazaar) on Jerusalem artichokes aka sunchokes, I’ve been on the look out for them in my regular grocery store. So when I saw them in Whole foods, I grabbed a handful to try and made this vegan mashed potatoes and sunchokes. I bought a seasonal variety bag of purple, red and yellow baby potatoes and I used them in this dish. Place the potatoes & sunchokes in a medium sized saucepan, add water about 1” above the potatoes. Bring to a boil; turn the heat to low and simmer for 15-20 minutes or until the veggies are fork tender. Drain the potatoes well and place them back in the same hot pot to evaporate any leftover water. 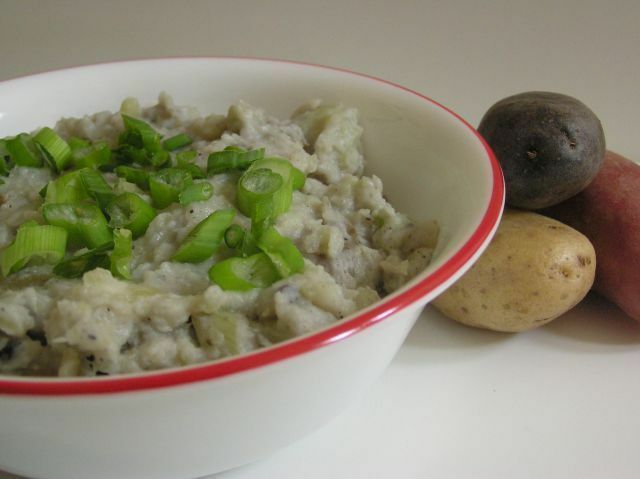 Mash with a potato masher; add soy milk as you mash for easy handling. Mix in the cream cheese and butter; season with salt and pepper.